San Antonio’s vast metropolitan outreach and numerous highways mean a lot of vehicular traffic. The pebbles kicked up by vehicles in front of your car, falling tree limbs and other debris result in windshield damage. This can be a minor chip or a long crack. You can’t drive around with a damaged windshield as it compromises your vision and jeopardizes your safety on the road. What you need is an effective repair or windshield replacement in San Antonio by an auto glass specialist at Mobile Glass. Mobile Glass—San Antonio fixes things so precisely that we promise your cracks and chips won’t spread further—ever, or our techs will eagerly repair it and credit you for a replacement for free. Want to know more? Please see our warranty. We offer mobile windshield repair at any San Antonio destination of your choice, including Live Oak, Boerne, New Braunfels and Somerset, to name just a few. You don’t have to drive any auto body shop, just book an appointment with our technicians and get the repair done at a location convenient to you. Mobile Glass saves you time, money and stress! As good as we are, don’t forget one thing: repairs can’t be made on moist glass! The damaged area must be dry. If the forecast predicts a storm is on the way, then take a piece of scotch tape and stick it over the crack. This precaution should help you keep water out until a repair can be made. Also note that if you have had a rock chip or a crack filler inserted before, then it isn’t possible to insert resin into a crack already filled with the repair formula; therefore, repairs can only be done once on a crack. Our highly-qualified San Antonio auto glass repair technicians use the highest quality windshield repair kits and machinery to provide every job without mistakes. Cracked glass problems in San Antonio are always around these days. The reason for this is because bustling San Antonio’s roads are constantly under repairs. These areas are prone to small rocks and therefore add more risks on the roads: a sure hazard for windshields that pass by! If it happens to you, don’t worry: San Antonio Texas Mobile Glass will come to you today and repair your windshield chip for free if you have insurance. If not, repairs in San Antonio are very reasonably priced, so give us a ring now before your chip becomes a huge crack! Most chipped windshields can be looking like new in less than an hour – how convenient is that!? Remember, Mobile Glass—San Antonio warranties all windshield chip and crack repairs completed by our techs will never “run” any further! Windshield rock chips measure under 0.5 inches in length and detract from your car’s overall appearance. More importantly, they can spread to other areas of the windshield and damage it further. As the adage goes ‘a stitch in time saves nine,’ get the cracks in your windshield fixed immediately to avoid an expensive windshield replacement in the future. You don’t have to look around much for a reliable windshield chip repair service—Mobile Glass is just a phone call away. Our rock chip repair process does an excellent job of erasing the unsightly chips in your windshield. A highly effective process, it involves injecting special adhesives into the damaged areas of the windshield. Mobile Glass has been in this field for years, and one thing is a must: don’t use low-cost materials with your tools! Our company’s windshield repair kits run a couple hundred dollars, each. These kits use the industry’s newest technology: they’re not just plain glue like many other do-it-yourself kits. Windshield crack repair is a bit more problematic than a plain chip repair, but it’s actually one of our many specialties! In San Antonio, cracks can spread faster than in other cities across the nation. Why that is? Heat. San Antonio is typically a warm, dry place, so repairs can be carried out during almost any day of the month, anywhere in town. Extreme sun exposure – especially in San Antonio, Texas – combined with fast changes in temperature cause windshields to change in size. This small movement is enough to crack a windshield by changing the crystals of the glass and making a crack spread across your entire windshield in just minutes or even seconds. These cracks are always sensitive, making it hard for repair techs to prevent them from spreading. Instead, the technicians need stop both the spreading of the crack and fill it in with resin so that it holds properly and seals the break correctly. Longer chips (measuring over 1 inch) are categorized as cracks. A crack in your windshield must be looked into immediately. Depending on the length of the windshield crack and the extent of damage, you may require a windshield crack repair or a complete windshield replacement. A chip measuring more than 3 inches qualifies for a windshield crack repair at Mobile Glass. Our skilled technicians use advanced tools to fix the cracks in your windshield within the promised time. If you’re unsure about your windshield repair needs, get solutions from our knowledgeable technicians over the phone. We offer round-the-clock phone advisory service to help San Antonio residents with their auto glass problems. Our windshield leak repair, windshield rock chip repair and crack repair prices are some of the best the industry has to offer. 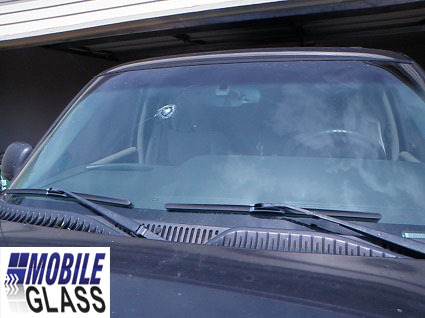 For effective, timely and affordable San Antonio car window repair solutions, contact Mobile Glass today.